Introduction:Sorafenib chemotherapy is the first-line therapy for patients with hepatocellular carcinoma (HCC) in an advanced stage. The aim of this study was to evaluate prognostic factors of survival in HCC patients treated with sorafenib, in real-life clinical practice. Material and methods: Retrospective study of HCC patients who initiated treatment with sorafenib, following assessment and indication from the multidisciplinary group. Results: There were included 36 patients, mostly male (89%) and with a mean age of 65 years. The main etiologies were chronic hepatitis C (44%) and alcoholic liver disease (36%). Twenty patients (56%) were classified as Child–Pugh A and 16 patients (44%) as Child–Pugh B. Half of the patients group were staged as BCLC C and the remaining as BCLC B. Significant adverse events were observed in 15 patients (42%) and were associated with longer survival (21.5 vs. 3.2 months, p < 0.001). 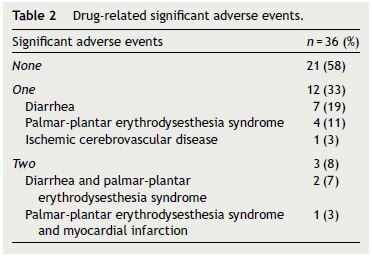 The most frequent adverse events were diarrhea and palmar-plantar syndrome. 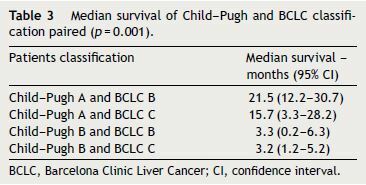 Median survival was 17.3 months for Child–Pugh A versus 3.2 months for Child–Pugh B patients (p = 0.001). Within Child–Pugh A, median OS was 21.5 months for BCLC B patients and 15.7 months for BCLC C patients (p = 0.001). Discussion and conclusions: The main prognostic factors beyond Child–Pugh class and BCLC stage included the occurrence of significant adverse events. Being related to increased time of exposure to the drug, it points out the need of dose reducing instead of discontinuation whenever significant adverse events occur. Keywords: Antineoplastic Agents/therapeutic use. Carcinoma, Hepatocellular/drug therapy. Liver Neoplasms/drug therapy. Sorafenib. Introdução: O tratamento de primeira linha de doentes com carcinoma hepatocelular (HCC) em estadio avançado é a quimioterapia com sorafenib. O objetivo deste estudo foi avaliar os fatores de prognóstico de sobrevivência em doentes com HCC tratados com sorafenib, na prática clínica. Material e métodos: Estudo retrospetivo com inclusão dos doentes com HCC que iniciaram tratamento com sorafenib, após avaliação e decisão de grupo em reunião multidisciplinar. Discussão e conclusões: Os principais fatores prognósticos, além da classificação de Child-Pugh e do estadiamento BCLC, incluíram a ocorrência de efeitos adversos. Estes, relacionados com o tempo de exposição ao fármaco, assinalam a importância de uma estratégia de redução de dose em vez de descontinuação quando se manifestam efeitos adversos significativos. Palavras-chave: Antineoplásicos/quimioterapia. Carcinoma Hepatocelular/quimioterapia. Neoplasia do Fígado/quimioterapia. Sorafenib. The aim of this study was to evaluate the prognostic factors of survival in HCC patients with advanced BCLC stage, or intermediate stage as second line, treated with sorafenib in real-life practice conditions. Retrospective study of HCC patients who initiated treatment with sorafenib since 2010, with a follow up period up to 2014. The diagnosis of HCC was established according to international guidelines, namely the AASLD criteria14 until 2012 and the EASL-EORTC guidelines5 since 2012. Sorafenib was given as first line therapy in advanced stage or as second line in intermediate stage patients after locoregional treatment, following assessment and indication from the multidisciplinary group special dedicated to this topic. Therapy regime was 400 mg of sorafenib twice daily, except for those who reduced the dose to 400 mg daily due to adverse events. At baseline, clinical and analytical variables were assessed. During sorafenib treatment, the occurrence of adverse events, dose reduction or suspension, serum AFP levels and imagiological response were evaluated. Data was collected from clinical records of patients. Adverse events were evaluated according to the National Institute Common Terminology Criteria for Adverse Events v4.03. Significant adverse events were defined as grade 2 or higher. OS was measured from the starting date of sorafenib therapy until the date of the last contact. Tumor response was accessed by computed tomography (CT) or magnetic resonance imaging (MRI) according to Response Evaluation Criteria In Solid Tumors (RECIST) and modified RECIST (mRECIST). The primary endpoint of the study was identification of predictive factors of prognosis. The secondary endpoint was evaluation of safety. This study was approved by the ethics committee of this center. All data were analyzed by descriptive statistics and Fisher's exact test for categorical variables. Survival data was analyzed by Kaplan–Meier statistics with the Log-rank test. Statistical significance was established at p < 0.05 for all tests. All statistical analysis was performed by use of IBM® SPSS® Statistics v21. During the study period, 36 consecutive patients from the gastroenterology department were included, corresponding to 13% of the patients evaluated by the multidisciplinary group. The main characteristics of the patients are reported in Table 1. The majority of patients were male (89%) and the mean age was 65 years. A histological diagnosis of hepatocellular carcinoma was performed in 28% of the patients. Regarding the cancer etiology, the main causes were chronic HVC infection in 16 patients and heavy alcohol consumption in 13 patients. According to Child–Pugh score of chronic liver disease, 20 patients were classified as Child–Pugh A and 16 patients as Child–Pugh B. According to BCLC staging classification, half of the patients were BCLC C and the remaining BCLC B.
Twenty-two patients (61%) received sorafenib as initial treatment. Transarterial chemoembolization (TACE) and liver resection were the most common previous treatment before sorafenib. Four patients performed other treatment besides sorafenib, particularly, three patients underwent TACE and one patient had radiofrequency ablation (RFA). The median treatment duration was 4.3 months (P25: 1.7; P75: 19.9), and treatment duration was longer in Child–Pugh A versus Child–Pugh B patients (p = 0.001) and in BCLC B versus BCLC C patients (p = 0.031). Significant adverse events with sorafenib were observed in 15 patients (42%). The most frequent were diarrhea and palmar-plantar erythrodysesthesia syndrome (Table 2). Particularly, nine patients (25%) had diarrhea and seven patients (20%) exhibited palmar-plantar erythrodysesthesia syndrome that was improved in most cases with sorafenib dose reduction and medical treatment. Three patients presented more than one significant adverse event. In the total of patients with adverse events, 87% were classified as Child–Pugh A and 13% as Child–Pugh B (p = 0.002) and 67% had BCLC B and 33% BCLC C stage disease (p = 0.176). Dose reduction as a result of adverse events was observed in 13 patients (36%). Twenty-six patients (72%) discontinued sorafenib due to disease progression and one patient due to persistent adverse events, namely diarrhea. Half of the patients performed an imaging reevaluation, mostly by abdominal CT or MRI. In the other patients the main reasons for absence of radiologic reassessment were short survival (25% of patients died in the first 3 months) and clinical progression. These patients were evaluated according to RECIST criteria, two patients (6%) had partial response, nine patients (25%) were classified as stable disease and seven patients (19%) underwent disease progression. Sixteen patients were also evaluated according to mRECIST criteria, one patient reached complete response, four patients (11%) had partial response, three patients (8%) had stable disease and eight patients (22%) underwent disease progression. Four patients out of 16 were reclassified into a different response stage when applied mRECIST criteria. At the time of analysis, five patients were still alive and continued treatment and 31 patients have died. Median OS was 6.8 months (95% CI, 3–10.6). Survival rates differed according to the Child–Pugh class (median OS Child–Pugh A 17.3 months (95% CI, 5.3–29.4) versus Child–Pugh B 3.2 months (95% CI, 0.9–5.5); p = 0.001) (Fig. 1) and BCLC stage (mean survival BCLC B was 21.5 months (95% CI, 7.5–35.4) versus BCLC C 4.2 months (95% CI, 1.7–6.7); p = 0.017). 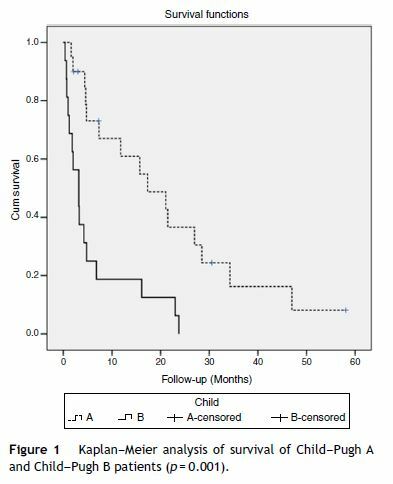 When we paired the Child–Pugh and BCLC scores, greater OS was observed in patients with Child–Pugh A and BCLC B (21.5 months) and in Child–Pugh A and BCLC C (15.7 months) (p = 0.001) (Table 3). 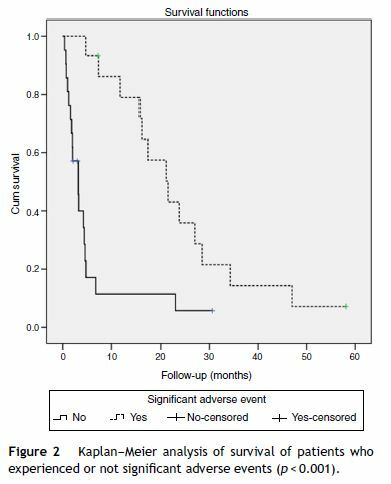 Patients who had significant adverse events showed a higher median survival (21.5 months, 95% CI 14–29) than those without significant adverse events (3.2 months, 95% CI 1.6–4.8) (p < 0.001) (Fig. 2). When evaluating the survival with the stratification of baseline staging (Child A patients with BCLC stage B or C) there was also a better outcome for the patients that experienced adverse events, although it was only achieved statistical significance for BCLC C patients (median OS 15.7 months with adverse events vs. 4.6 months without; p = 0.031) and not for BCLC B (median OS 27 months with adverse events vs. 4.4 months without; p = 0.627). The survival rate of the group of patients who presented, at baseline, total bilirubin levels below 2 mg/dL was 16.1 months (95% CI, 6.4–25.9) versus 3.3 months (95% CI, 1.3–5.3) for the group with total bilirubin levels above 2 mg/dL (p = 0.004). For the group of patients who had, at baseline, serum albumin levels above 35 g/L, survival rate was 21.5 months (95% CI, 12.1–30.9) and for the group who presented serum albumin levels below 35 g/L was 4.2 months (95% 1.8–6.6) (p = 0.003). There was no statistically significant difference in OS based on serum AFP levels, platelet count and age variables. This study confirms the benefit of sorafenib in OS, namely in Child–Pugh A patients. According to the Child–Pugh class, Child–Pugh A patients had a significantly higher median survival versus Child–Pugh B, as verified in Pressiani and colleagues study.15 Therefore, liver function of patients in sorafenib therapy is an important prognostic factor of survival. We also found significant differences in survival for the group of patients who present total bilirubin levels below 2 mg/dL and serum albumin levels above 35 g/L. These measures are employed in the criteria of Child–Pugh classification, so these results reflect that patients with better liver function (Child–Pugh A) have a greater benefit of sorafenib. In Edeline et al study,19 mRECIST was considered to be a useful prognostic parameter that might be helpful to guide the maintenance of sorafenib. In our study, fewer patients underwent evaluation according to mRECIST, mainly due to short survival and clinical progression, not allowing us to assume conclusions regarding its role as a prognostic parameter. Personeni and colleagues suggested that AFP is an independent variable to predictive the response of patients with hepatocellular carcinoma doing sorafenib, but it should be combined with the evaluation of radiological response.20 Our study did not find any correlation between serum AFP levels and OS. Furthers studies are needed to validate this potentially prognostic factor. Currently, new molecular agents for second-line treatment or in combination with sorafenib are under investigation.21 Although several trials were negative it is expected that some agents could further improve the outcome of HCC patients. The main factor of prognosis identified beyond Child–Pugh class and BCLC stage, as previously described, was the occurrence of significant adverse events. This fact could be related to increased time of exposure to the drug, depending on the strategy of not discontinuing sorafenib, but reducing its dose instead. E-mail address: hcmail@sapo.pt (H. Cardoso).